This paper was first given at the Stockholm Conference on Human Rights, May 26, 2015. This concludes the post that appeared yesterday. For most of the critiques of human rights, the tragic flaw in the entire system, the serpent in the garden of universal rights, is the state. In theory, the state has no role in determining human rights, which pertain to the species rather than the polis. Indeed, modern human rights—the UDHR version—were conceived as a way of protecting individuals, and the “intermediate institutions,” as Malik called them, of family, profession, and science, against the state. The most frequent targets of human rights actions are states; individuals acting on their own behalf are rarely if ever charged with such crimes because while individuals must obey the law, they do not make the law and not obliged to enforce it. States are legal structures and are therefore presumably committed to a deeper principle of legality as such; accordingly, the argument goes, they will be responsive to claims or arguments grounded in this deeper principle even when those claims and arguments implicitly call into question not just their legitimacy as legal structures but the legitimacy of the entire system of states by which the world is organized and governed. From the first, it was understood that the cause of human rights confronted the state as its primary antagonist. That, at least, is the theory. But in this case as in others, theory and practice have not coincided. The Universal Declaration was the product of a commission formed by the United Nations and it was always understood that nation-states, or some voluntary collaborative organization formed and supported by nation-states—the “international community”—was to be the instrument of both adjudication and enforcement in human rights cases, in which, consequently, state power or some derivative thereof stands in the position not only of the accused, but also, frequently, of the accuser, and invariably as judge, jury, and executioner. As Moyn puts it, the Universal Declaration “retains, rather than supersedes the sanctity of nationhood,” and even, he adds, of colonial rule. The serpent not only lives in the garden; it owns it. 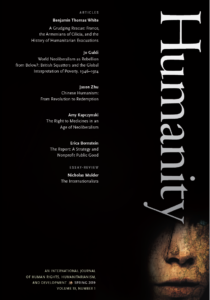 Perhaps the most powerful instance of reflection on the history and meaning of human rights in this vein—and the one to which many recent volumes constitute extended footnotes—is that of Hannah Arendt, whose thoughts on “The Perplexities of Human Rights” appeared in the second volume of The Origins of Totalitarianism. Arendt distinguishes between the droits de l’homme proclaimed in the French Revolution, and the universal human rights coined in the 1940s. Both concepts, she argued, were based on what she regarded as a destructive fantasy of the unity of humankind, mankind at large; the difference was that the revolutionary conception effectively undermined the legitimacy of any state by positing a higher law (hence the lawless Terror); while the modern fantasy of oneness was primarily rhetorical—not even the signatories to the document believed in it. In fact, the human rights proclaimed in 1948 protected only those living in states. Left outside the protected zone of the “human” were the millions who had been dispossessed of statehood by the war, or by the turbulence of history generally: the supposedly inalienable rights of man were completely unenforceable in the case of those who were not citizens of any sovereign state. The “abstract nakedness of being human” (299) not only does not guarantee human rights, it signals a condition of utter rightlessness that provokes one of her most famous formulations, the “right to have rights,” that is, to be a part of some enveloping social and political order (296). Thus, she concludes, by positing a natural or universal humanity outside the political order, modern human rights would, if taken seriously, actually define people in a way that would deprive them of any rights whatsoever, placing them at an even more extreme disadvantage compared to those living in states. In its emphasis on an almost perverse wrongness associated with the concept, Arendt’s reading may be considered both the model and the extreme of reflection on the meaning and history of human rights. She is perhaps, as we will see, most typical in her unwillingness to abandon the cause of modern human rights, much less to endorse the revolutionary concept, grounded as it was in the Terror. Hence the title of one of her sections: “The Perplexities of the Rights of Man.” The most worldly of philosophers, Arendt is reduced, in contemplating human rights, to handwringing: “No paradox of contemporary politics is filled with a more poignant irony than the discrepancy between the efforts of well-meaning idealists who stubbornly insist on regarding as ‘inalienable’ those human rights, which are enjoyed only by citizens of the most prosperous and civilized countries, and the situation of the rightless themselves” (279). Paradox, irony, perplexity—in reflecting on attempts to deal with mass human suffering on an unprecedented scale, Arendt is reduced to the vocabulary of the New Critics of that era, who argued that poetry constitutes a self-contained world with no purchase on the real world. Reflection, it seems, has some limitations. With its proliferating perplexities, paradoxes, ironies, contradictions, and difficulties, reflection seems to have brought us to the point of rejecting altogether any attempt to specify or to enforce human rights. Simone Weill reached just this point near the end of her life, and her thinking might illuminate the path that lies before us as we contemplate taking this fateful step. In the early months of 1943, in difficult circumstances and failing health, Weill produced a manuscript, published posthumously in 1949 with the English title “The Need for Roots” (L’Enracinement). The book was intended as a response to a request from the Free French Resistance movement for a report that would contribute to a rebirth of France after the Germans had been defeated. Weill took the opportunity to elaborate the concept of obligation, which, she felt, should be considered prior to and more fundamental than rights, with a better claim to being eternal and “situated above this world.” The French Revolution had gone wrong in basing its new society on rights, she argued, and would have done better to focus on obligations, which involved the essential needs of others rather than our own. Post-war France had, she argued, an opportunity to set matters right. Weill presumed that she was speaking to and for humankind at large. At the same time, however, she was speaking directly to the citizens of a resurrected France; her thinking was not universalistic in the way that modern human rights discourse is. Moreover, she was a highly idiosyncratic personality, with a perhaps minoritarian view of the redemptive power of physical labor, which she saw as the one great original idea of the West. She had an intimate, but again idiosyncratic relationship with God; and was peculiarly responsive to such concepts as rules, obedience, hierarchy, responsibility, collectives, and punishment. A fine spirit of assurance sweeps through Weill’s text. She does not seem perplexed; she confronts no poignant ironies; she sees no paradoxes or contradictions in her program. She does not reflect on human rights as much as she simply rejects the concept and replaces it with another. What has been gained, and what lost in this rejection? This question could be considered at great length, but here I will mention just one consideration: an emphasis on obligations makes it hard to recognize the injustices that attend inequality. In Weill’s account, we are all equal in our obligations, which come from above: the need for roots is also, in Weill, a need for a transcendent order, whose representatives here on earth are authority figures of unimpeachable virtue and probity, presumably including the post-war French state, to which people will rightly be expected to defer. Weill’s concept of obligation has a weight to it that those with a less angelic spirit than Weill herself might well find flattening, even crushing. Rights, by contrast, involve the defense of the particular, the singular, the individual. Under the regime of rights, we are presumed to be equal with respect to our deserts, but unequal with respect to our situations, and therefore vulnerable to those more powerful than ourselves, and in need of the protection offered by an explicit listing of rights. In short, the concept of rights gives us a way of articulating the kinds of wrongs suffered by individuals at the hands of collectives, especially of the state. If we were to permit ourselves to be overwhelmed by perplexities to the point of abandoning the entire enterprise of rights, we might lose something very precious, a conceptual resource that, however conflicted or incoherent, has demonstrated its efficacy over the years and across the world, most recently in Ireland, where the marriage equality vote began as a case brought before the European Court of Human Rights. The concept of human rights may be corrupt or conflicted, but it is no more so than the world in which it seeks to intervene. To abandon, as a consequence of humanistic reflection, the effort to define and enforce human rights would, I think, also be a disservice to reflection, a misunderstanding of its responsibilities and limitations. It is the enduring task of reflection to elaborate difficulties, especially in cases where we are being asked to accept something as given, natural, sacred, or otherwise beyond dispute or inquiry. The humanistic disciplines, especially those that emphasize interpretation, judgment, or evaluation, probe the documents and artifacts of the past for hidden potentialities, possibilities of self-difference, transformation, or re-imagining. Reflection on history and meaning reanimates the dead, humanizing the implacable face of the eternal, particularizing the universal. There is indeed a need for this kind of reflection. Yet there is also another need, or several needs: for a sense of durability, for a space not dominated by interest and power, for a kind of thinking whose dimensions are not set by the world as it is. The concept of universal human rights speaks to these needs, which are so directly implicated in basic human capacities that it is difficult to imagine a human life in which they were altogether unknown. And so it is heartening to see signs that some of the most committed critics of human rights are now beginning to understand that humanistic inquiry does not necessarily lead to the abandonment of the concept of human rights. Samuel Moyn, perhaps recoiling from the prospect of a world in which the concept of human rights has passed from the scene along with the other obsessions of the 1970s, has recently said that human rights should not in fact be displaced as a moral language, but should reconstitute itself as a normative rather than a descriptive discourse; indeed, he argued, human rights should double down, conforming even less to reality, unapologetically claiming to transcend judges and laws, seeking explicitly to transform the world by confronting power, and taking up social and economic rights in addition to political and civil rights. This acceptance of the perplexities seems to me not cynicism, surrender, or reversal, but rather maturity. Perhaps, then, we could agree to remain agnostic on the content of human rights, to suspend our impatience with perplexities, and still agree that there are causes or principles that can command the respect of the world precisely because they are unrealized in the world—which badly needs them. Samuel Moyn, The Last Utopia: Human Rights in History (Cambridge: Harvard University Press, 2010), 92. Hannah Arendt, The Origins of Totalitarianism (Orlando: Harcourt, Inc., 1968; originally published 1951); see esp. “The Decline of the Nation-State and the End of the Rights of Man,” 267–302. 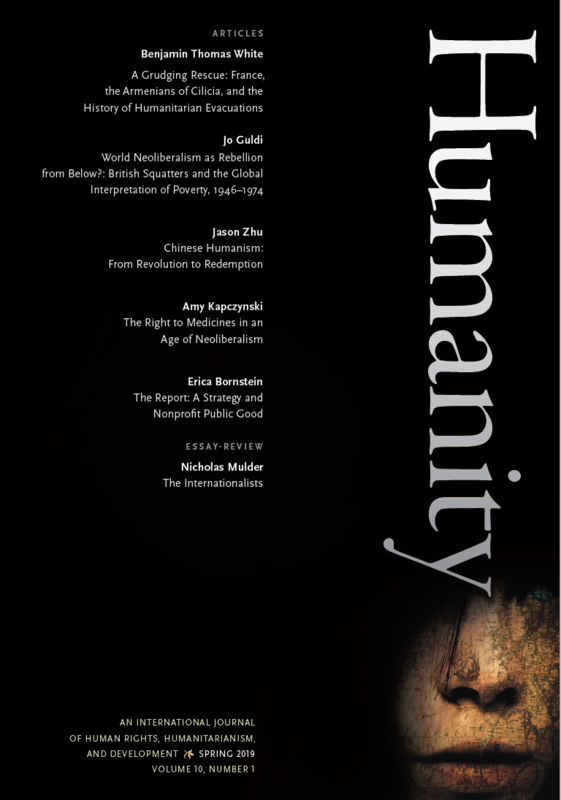 Samuel Moyn, Human Rights and the Uses of History (New York: Verso, 2014), 135–47. Geoffrey Harpham is a Visiting Scholar and Senior Fellow at the Kenan Institute for Ethics. He was trained as a literary scholar, but has worked in a wide range of fields within the humanities. His abiding concerns have been ethics and literary study, the concept of language, the work of Joseph Conrad, and, more recently, a variety of issues relating to educational theory and practice, especially the humanities. His more recent books are Language Alone: The Critical Fetish of Modernity, The Character of Criticism, and The Humanities and the Dream of America. He is the co-author, with M. H. Abrams, of A Glossary of Literary Terms. From 2003-15, he was the director of the National Humanities Center in Research Triangle Park.